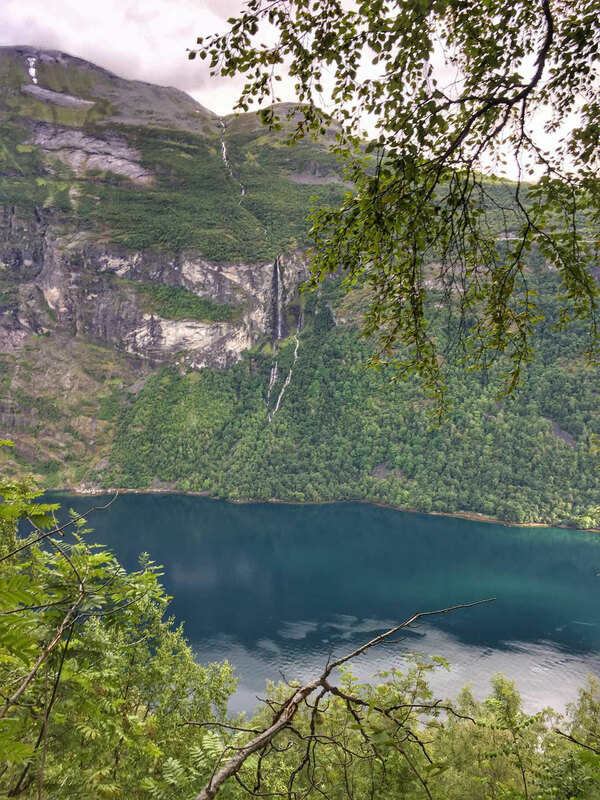 We were initially hesitant to visit the town of Geiranger after reading some accounts of how touristy it was and that it was not worth it to visit the town. 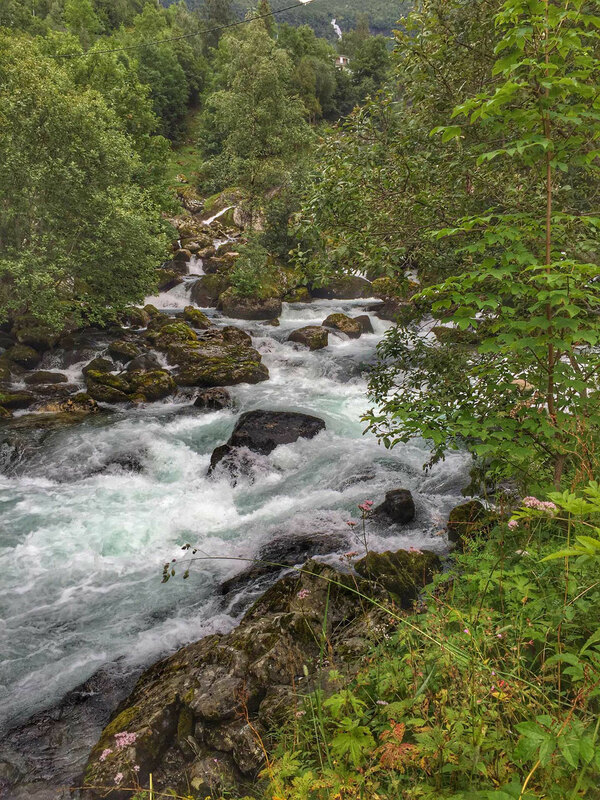 Thankfully, we like to make our own decisions about a place and after looking at some pictures of the world-famous Geirangerfjord, we could see it looked like a place we didn’t want to pass up. Geirangerfjord, the fjord which leads to Geiranger, is a Unesco World Heritage Site and is referred to as the “jewel in the crown” of the Norwegian fjords. 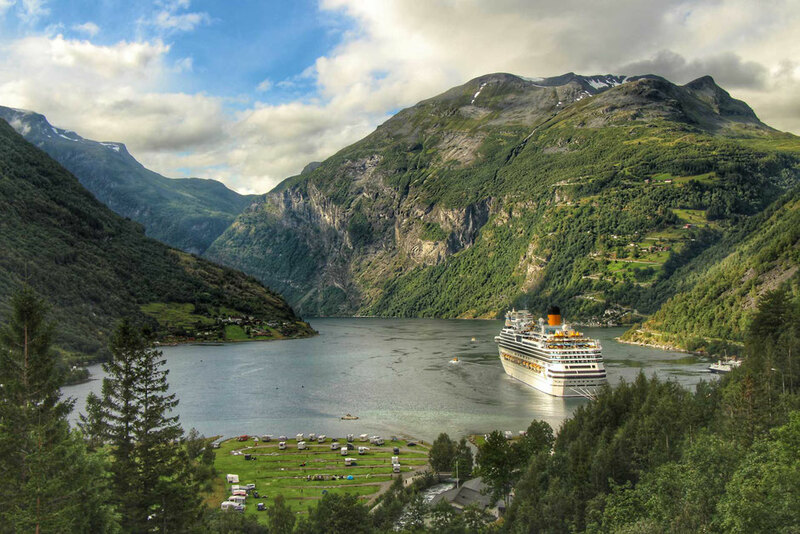 You can book a tour that will take you on a public bus from Alesund through some of the tourist towns along the way, then onto a ferry down the Geirangerfjord to Geiranger. This option allows you to book one way tickets and return on a different day. 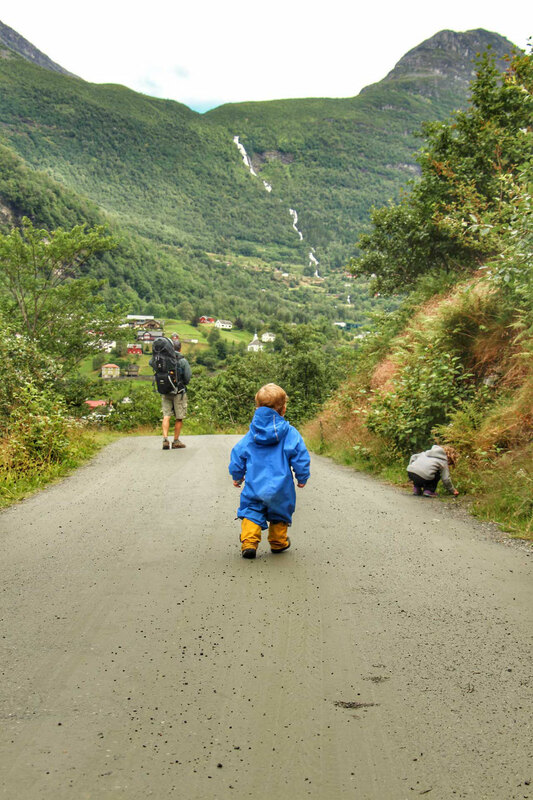 Some people may find it fun to rent a car and drive what is considered one of the toughest stretches of road in Norway from Trollstigen to Geiranger. 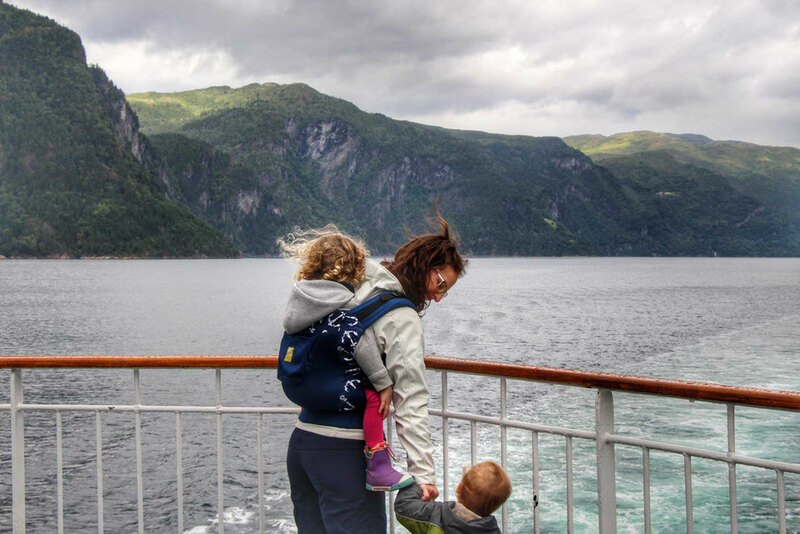 Since we had already experienced travelling in Norway by train (from Oslo to Bergen), and in a car (on our road trip along the Atlantic Road and Trollstigen), we were excited to add a new mode of transportation to our Norway adventure. 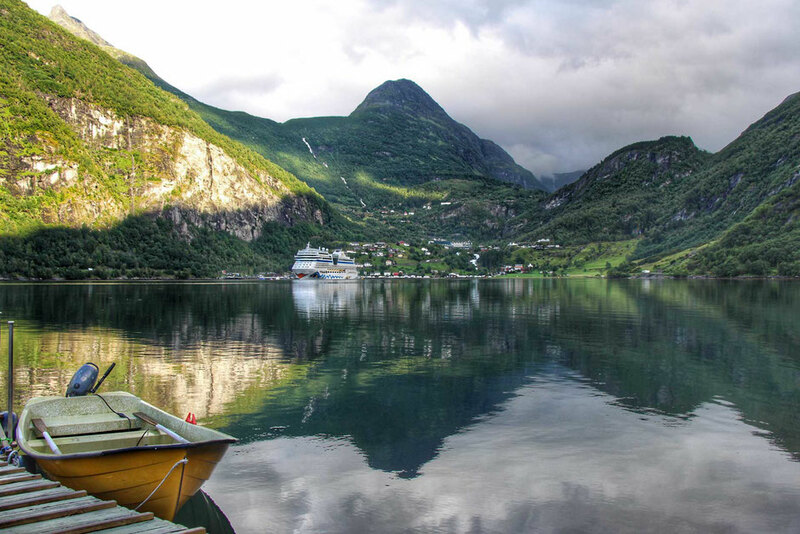 Known as one of the most beautiful fjords in the world and also one of Norway’s most famous attractions, we wanted to see the entire fjord from the water. 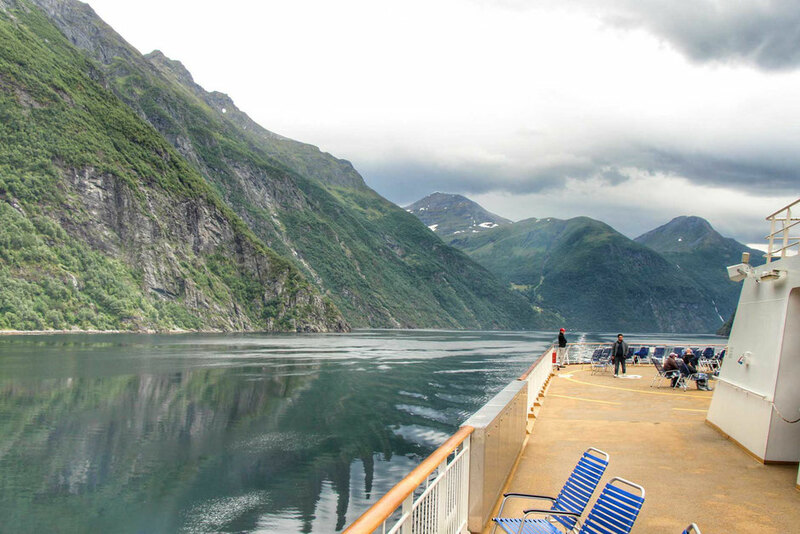 We booked a port-to-port passage on the Hurtigruten which took us directly from Ålesund, down the full length of the Gierangerfjord to Geiranger. We stayed a few nights then took the Hurtigruten back a couple of days later. Despite reading that the town of Geiranger was very touristy, we knew we would want to stay a couple of nights once we were there. 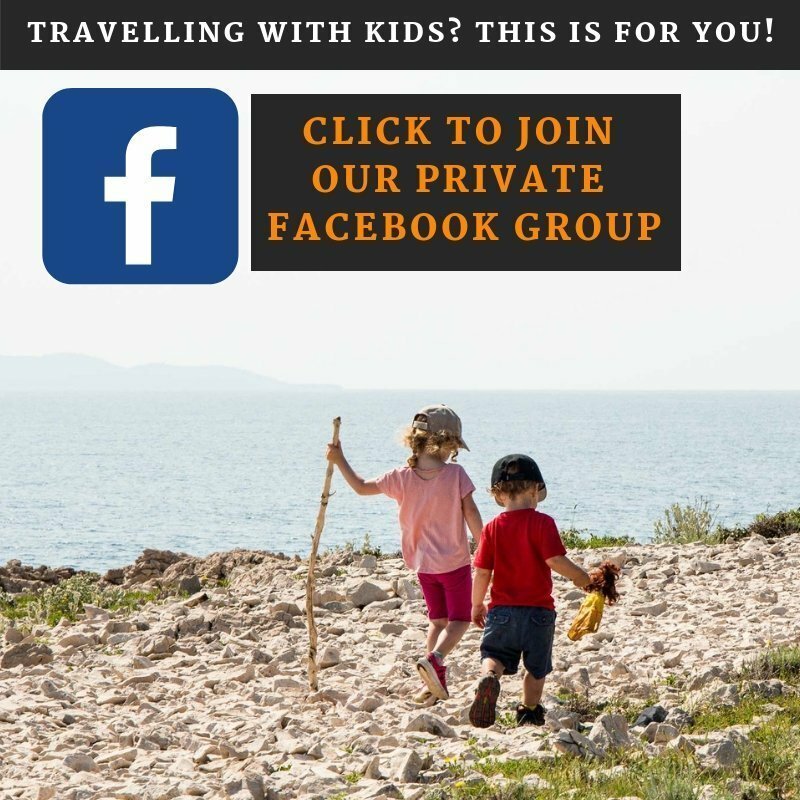 With two small kids, we try to avoid hotels and instead looked for alternate accommodations. We were lucky to find there was still availability at the Fjorden Campinghytter cabins. Though it was 1.5 miles (2.5 km) from Geiranger in Homlong, we would still have access to groceries (to be picked up when we arrived) and we could easily walk this distance. One complicating factor was that we did not want to haul our suitcases with us, so we planned to bring only the essentials for our time in Geiranger. We were already hauling the kids in backpack carriers on our back, so we had to limit what we brought to what we could carry on our fronts (and what would fit in the backpack carriers). We had arranged with a local hotel in Ålesund to store our suitcases for free for a few days. 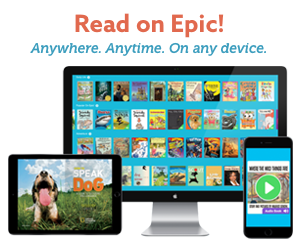 If there’s one thing we’ve learned, it never hurts to ask. (We won’t say which hotel as I don’t think the guy was really allowed to do that). Alternately, there is luggage storage at the bus depot for 40NOK per day ($5USD) and the Radission near the Hurtigruten dock charged 150NOK per day ($19USD). Fjorden Campinghytter has two different options for cabins. We opted for the larger cabin which had private toilet facilities, full kitchen facilities and a separate bedroom. This could not have worked out better. Aside from the struggle to carry the kids, our bags and groceries for 2 days the 1.5 miles (2.5km) to our cabin, once we were there it was bliss. 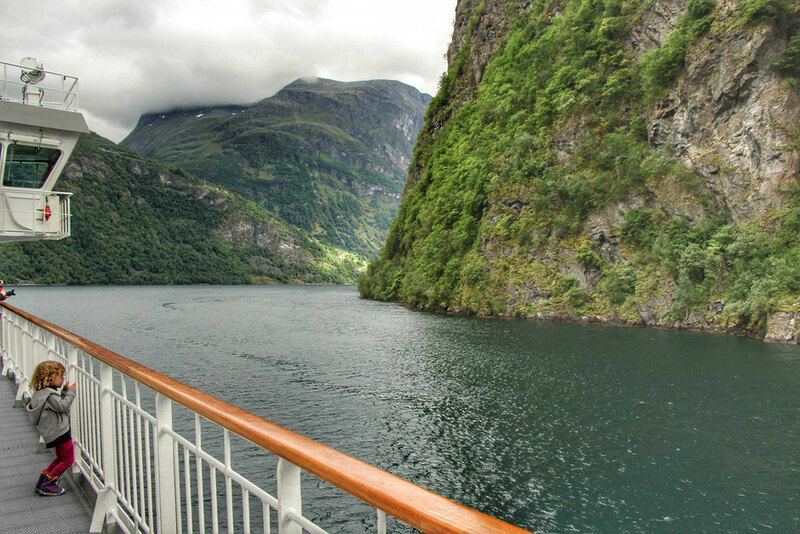 We were on the other side of the fjord, right on the water’s edge with the most incredible view. The cabins had a large outdoor area, which was perfect to let the kids run around, and a jetty where you could rent boats to tour the fjord (unfortunately, we did not get around to doing this). The layout of the cabin was also ideal. There were two single beds in the bedroom, which we used for the kids. The couch converted to two single beds in an L shape, which we happily used for ourselves as we got to wake up to the incredible views right out the window. The Hurtigruten voyage was even more beautiful than expected. The entire four hours we were treated to views of towering mountains, waterfalls, farms all lining the way. The only small downside was that it rained off and on during our passage, so being outside the entire time was not feasible. 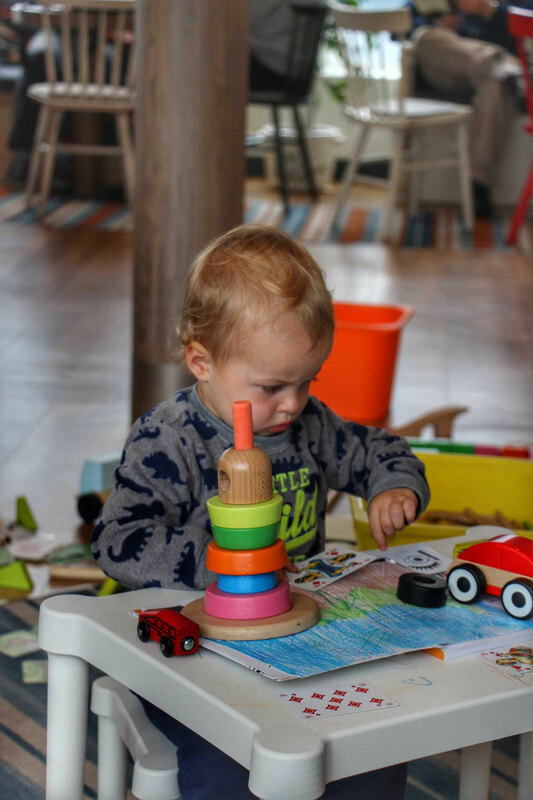 Instead, we parked ourselves in the bakery/coffee shop on the 7th floor where they had a little play area for the kids. This, plus the occasional walk around the ship, made it pretty easy to occupy the kids for the 4 hour voyage. With the kids occupied, we were able to take turns going outside to enjoy the view. Though we were only day passengers on the cruise ship, they had a luggage storage room where we were able to drop off our backpack carriers. Once we arrived in Geiranger, a shuttle boat brought us to shore, we stopped for groceries then walked the 30 minutes along a gravel road to our cabin. 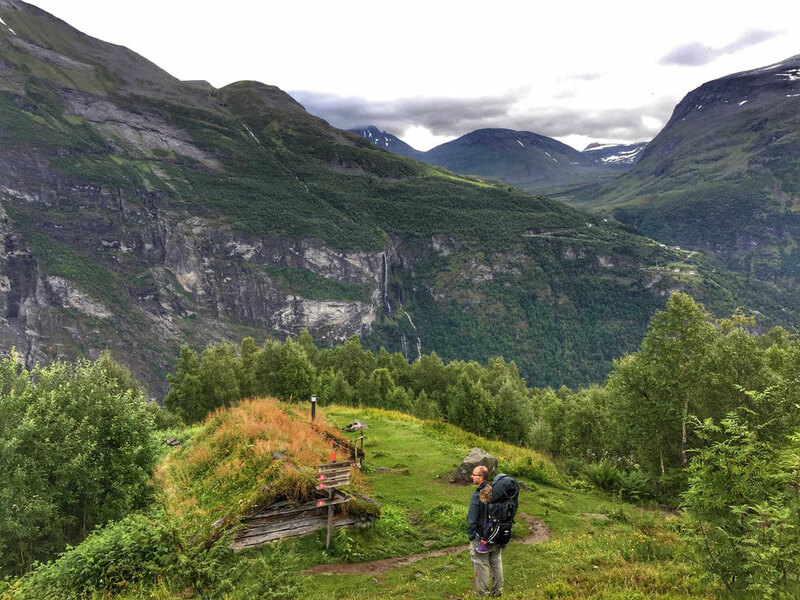 The number one thing on our list to do in Geiranger was the Skageflå hike to a historic mountain farms perched on the steep mountainside overlooking the fjord. 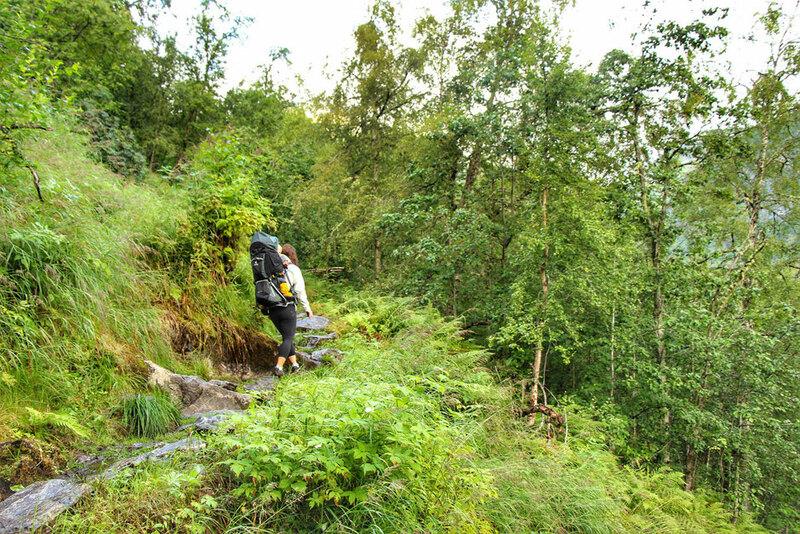 Typically, people take a boat from Geiranger to Skagehola, where you then walk up a steep and winding trail of rock steps to Skageflå. From there the trail continues another 950 feet (290m) above sea level to Homlungsætra, the summer dairy, then downhill to Homlong with the final 1.5 miles (2.5 km) along the road to Geiranger. Since we were already staying in Homlong, we decided to do the trail in the opposite direction and skip the boat ride. The trail began right from our cabin’s property line. As luck would have it, we woke up to rain once again, so we took our time getting ready. And once again, we were rewarded (or so we thought) with the rain stopping shortly after we started our hike. With the rain overnight, the dirt/rock trail was transformed into slippery rocks and mud. Not unfamiliar to us given our recent hike in Ålesund, but treacherous none the less. We knew from our past experience that going up, despite the steep incline, would likely be easier than coming back down. The first 1600 feet (500m) or so was especially bad, with large, smooth, slick rocks with moss to navigate over. We got off the trail a little at this stage, so that probably didn’t help. After this section, the trail became more structured, but was still rocky and muddy. Once the rain stopped, it was reasonably pleasant weather to hike in. This hike was one of the hardest of our trip – the conditions were bad and we climbed as high as 1800 feet (550m) over 1.9 miles (3km) in distance. It was short, steep and slippery. We aren’t complaining though, it was worth it. 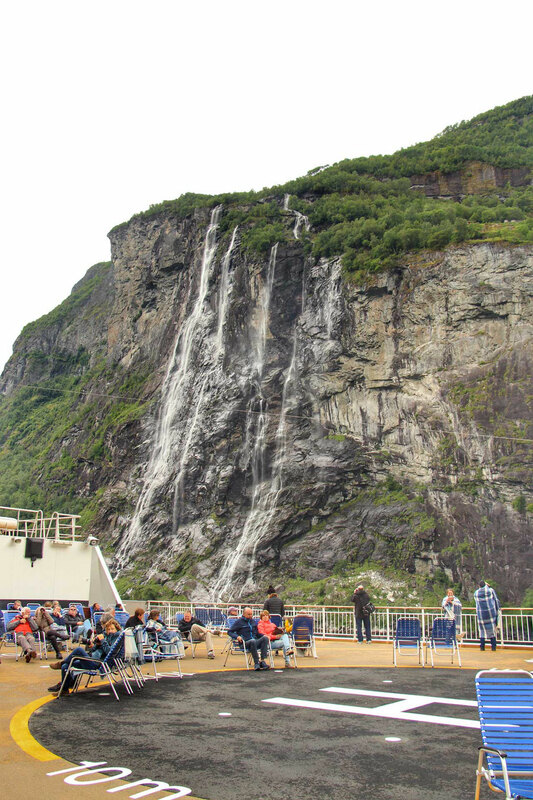 There were several stunning viewpoints of waterfalls and the fjord along the way. The forest we hiked through was especially lush and dense, making it even more enjoyable. Making it to the Homlongsaetra farm was definitely an accomplishment on this day with kids on our backs. 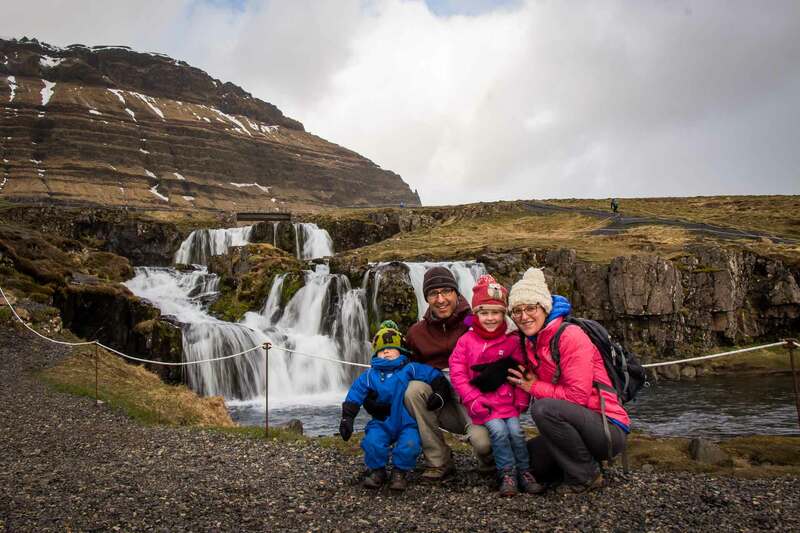 Though, I had personally really wanted to make it to Skageflå, travelling with kids means making the best decision for everyone. Continuing on would have meant hiking down a very steep area over a short distance which we would have had to climb back up on the return. The hike had already taken us longer than expected, the kids were over it and we knew what was waiting for us on the return trip. This is not in any downplaying how spectacular the Homlongsaetra farm was. It truly was some of the most impressive scenery we had seen. 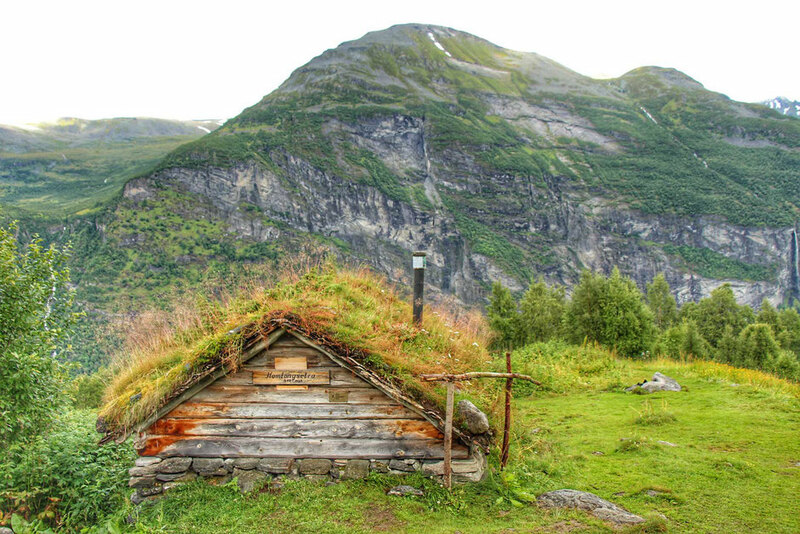 There were two buildings, both with grass and flowers growing on the roof, and the area was cleared, so there were great views of the fjords and waterfalls. 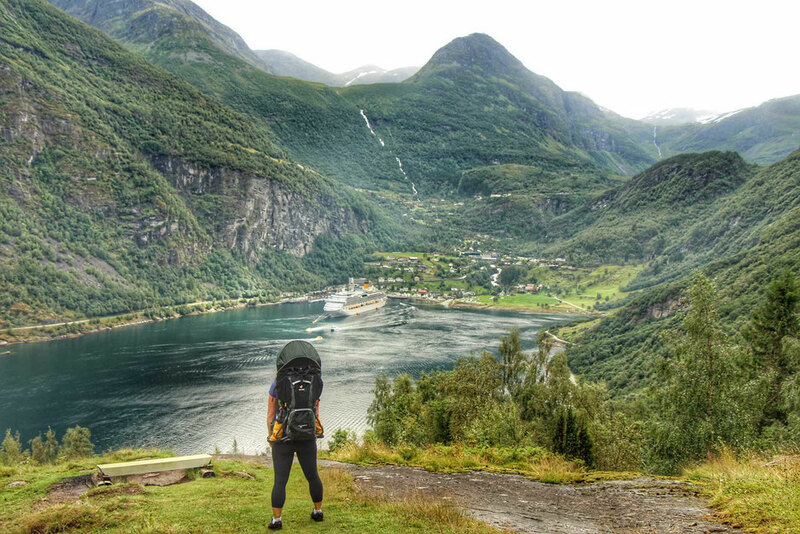 A very special place – amongst the best views we’ve ever had on a hike. Tip: When we are hiking away from home, we always use the Terra Map Pro Outdoor Trails hiking app to find local hikes wherever we are. 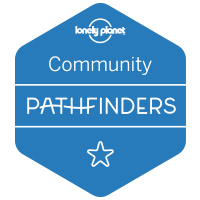 For us, its most important use is helping us stay on the right trail as trails are often not clearly marked. Our original plans were more ambitious with us doing a couple more hikes to some lookouts, but with the rain and carrying kids, we opted to take it easy. And our legs thanked us for it. In the afternoon, we let the kids walk the 1.5 miles (2.5km) from our cabin to town. It took us twice as long, but they needed the time to run around and have fun. Once in town, we climbed the 327 steps to the top of the waterfall, which has an incredibly powerful and impressive flow. 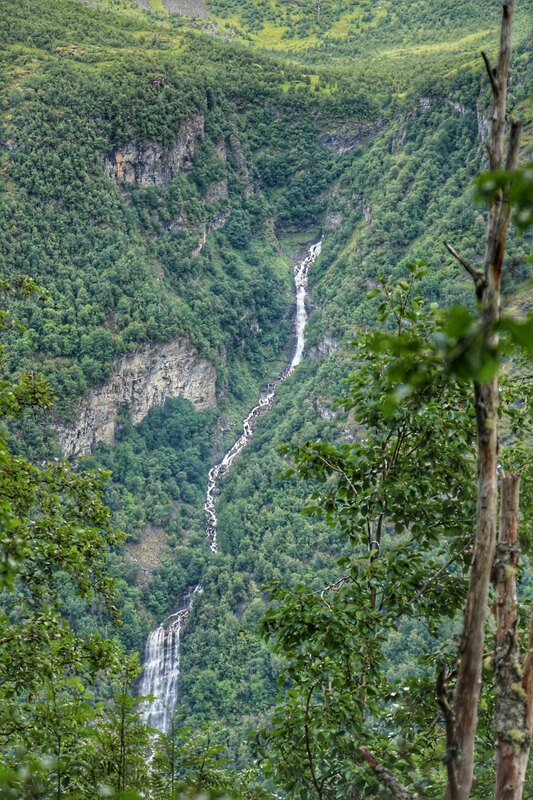 The waterfall was worth the visit as were the views looking back at the fjord. On our final morning, we made good use of the outdoor area around our cabins and let the kids run wild. They especially loved the boat dock, though it made us slightly nervous with our toddler on there. 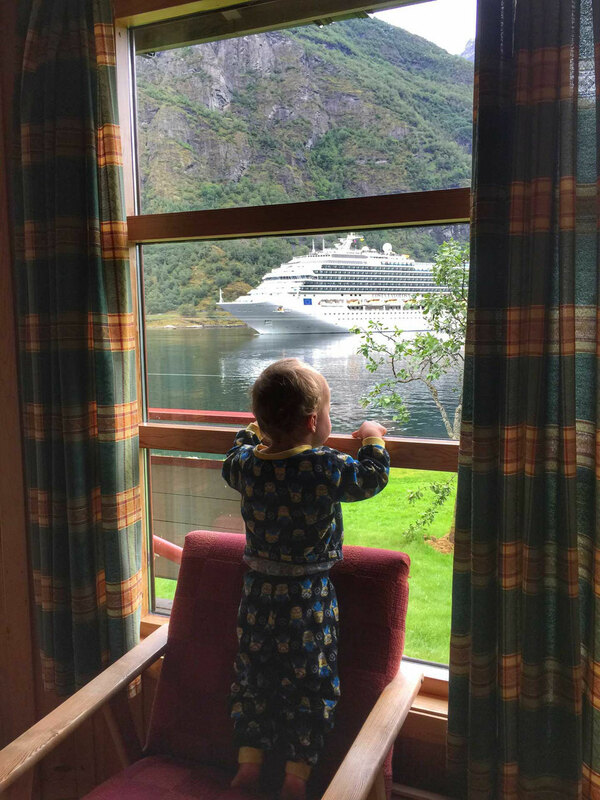 You never quite know how you’ll feel about a place until you are there, but we loved our time in Geirangerfjord and in hindsight wished we had spent an extra day or two there. Our cabin was comfortable and we loved the location. It was a really fun place to stay with the kids. 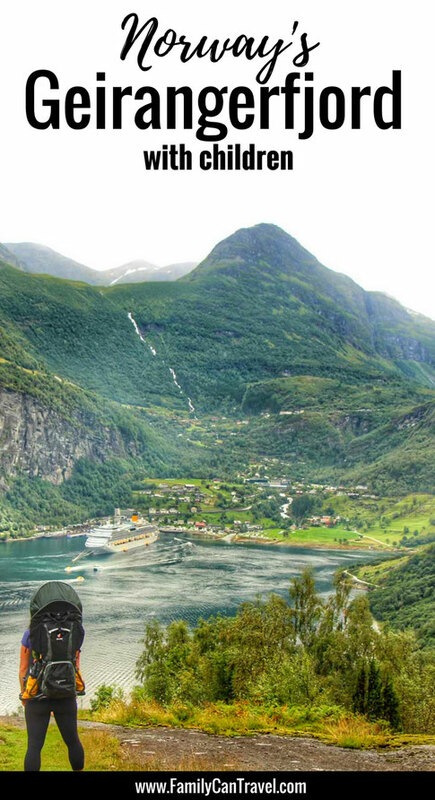 Don’t miss out on a trip to Geirangerfjord in Norway even if you read that it’s touristy. It’s one of Norways most famous attractions for a reason! Mount Dalsnibba: Enjoy a scenic bus drive up hairpin turns to the 4,900 foot summit of Mount Dalsnibba. 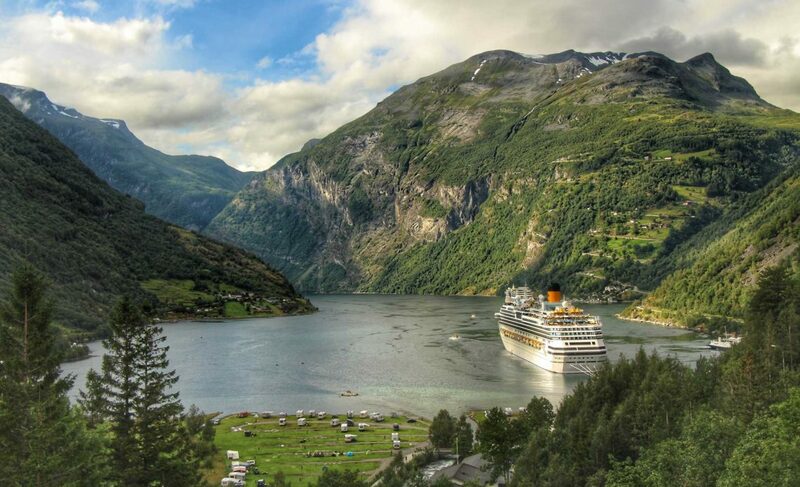 From here you will enjoy panoramic views of Geiranger and Geirangerfjord. 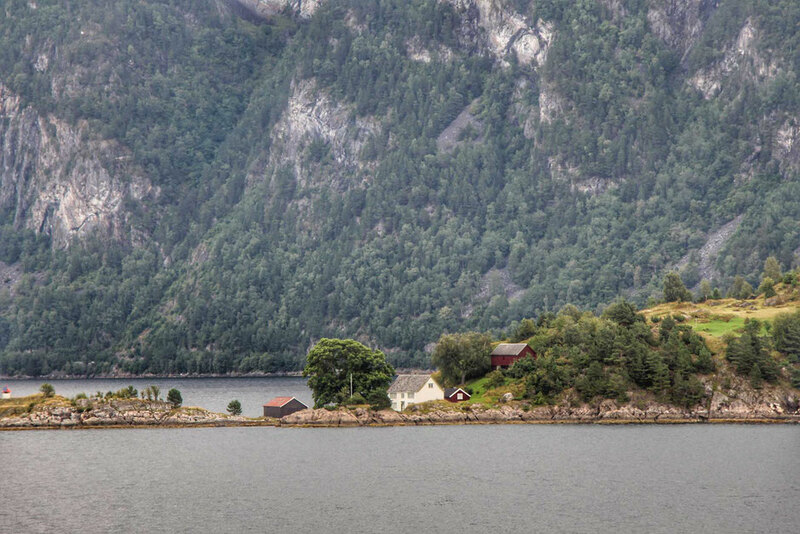 Herdal Farm: Enjoy a bus ride up the 11 hairpin turns on Eagle Road and then admire the beauty of the Geirangerfjord en route to Herdal Farm, where you will sample the owners delicous goat cheese. Hop On Hop Off bus: an easy way to see the Flydalsjuvet viewpoint from the cruise ship dock. 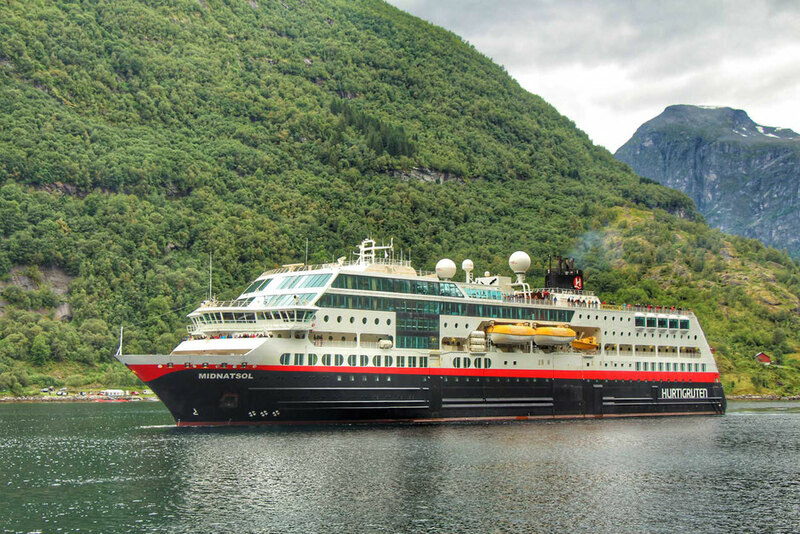 Hurtigruten Cruises – options include a day trip from Alesund or a full cruise up the Norweigan coast, this is the best way to experience the Geirangerfjord. 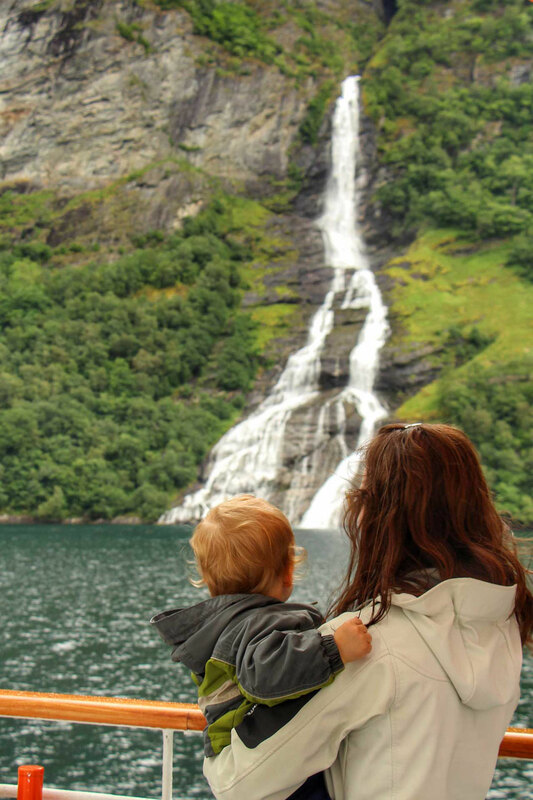 Have you been to Geiranger with kids? What was your favourite part? Tell us in the comments below.